This is a picture that I took of my kids having a picnic lunch today, and instinctively thought “I should put this up on Facebook!” I suppose because the kids look happy, they’re having lunch on a picnic rug, and maybe on some level it makes me feel like a good parent. We really go out of our way to present the best version of ourselves online. We’re just back from holidays and the weather is as beautiful here as it was in France, plus I’m not back at work until next week and the girls slept in until 8am- a perfect start to a perfect day. 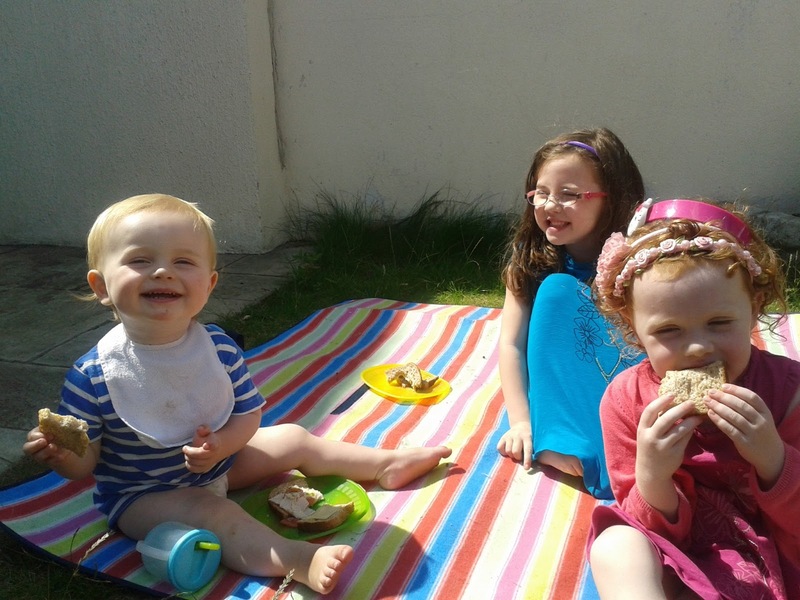 We had a picnic lunch in the garden – see the happy, smiling faces in the photo above. Then we set out ingredients on the garden table to make homemade ice-pops to freeze for tomorrow, which was a lovely way to spend time with the girls while the baby napped peacefully in his cot. The girls asked if I would paint their nails, and in turn they painted mine. After that we made heart-shaped sandwiches following a recipe in a children’s cookbook, and we brought the sandwiches to the playground for a late afternoon picnic, while playing on the swings in the gentle summer breeze. Then we picked up some fresh fruit and vegetables for tea and headed home to eat in the garden, bathed by the warm evening sun. Indeed, a perfect end to a perfect day. The smiley photo was preceded by an hour of squabbling over who got to be the princess and who got to be the sister in the game, and major complaints that the request for a snack two minutes before lunch was turned down. The photo was one lovely moment during an otherwise chaotic and very messy lunch. The homemade ice-pops were made using whatever we had in the fridge, so they are part orange juice, part water, and have chopped up grapes and strawberries thrown in, though very few as someone had been eating the strawberries out of the fridge all morning unbeknownst to me. Still, I think the pops will look pretty. 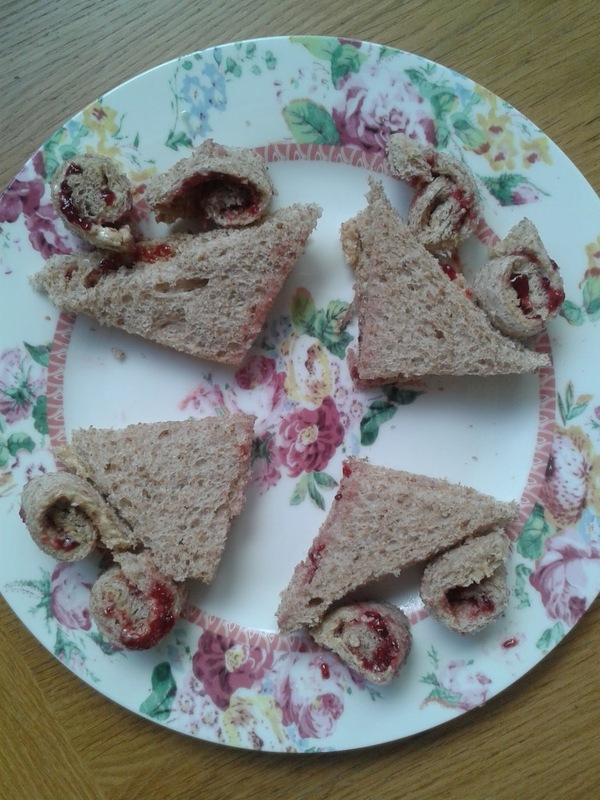 We basically spread jam on bread, cut it into triangles and strips, and rolled the strips. They actually loved doing this so much that I am considering agreeing to Clara’s request that we have them at her birthday party. But yeah, not exactly heart-shaped, not exactly pretty – no food-writers need to worry just yet! The playground was good except for the bit where Emmie came over crying that a bigger girl had told her to get off the swing. I have never, ever confronted another child in a playground but this was something I couldn’t ignore, so I spoke to the child, gently but firmly, to say it wasn’t very nice to tell someone to get off a swing. 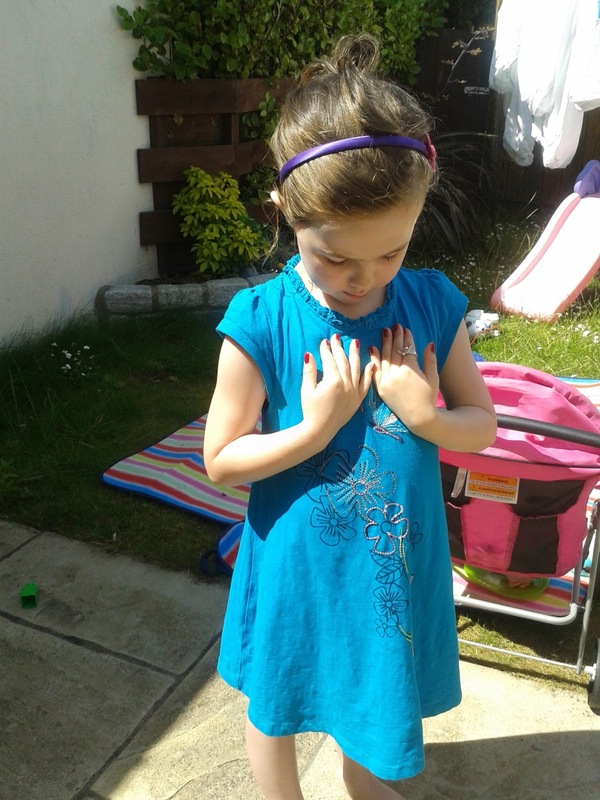 Anyway it transpired that the girl had just asked for a go, and my sensitive little four-year-old was all upset and didn’t know how to deal with it. Lesson learned by me. Our grocery trip was just as you might imagine it to be with three tired hungry kids, and our tea in the garden was plagued by two tenacious, over-sized flies, now deceased. But you know what, it was a good day either way. Great post. Family life is always chaotic. That’s what I love about blogging/social media, you focus on the positive stuff. The stuff you actually WANT to remember. The important stuff. Kids squabbles and less than perfect picnics are not important at all in the grand scheme of things. Those shining moments of quality time with your family are the memories being made. Ahh yes, sounds like our house!! Think the intense heat makes them all edgy and a bit cantankerous… I’ve had to dunk ours in a lukewarm bath many times when they got to ratty and sweaty. Enjoy the rest of your hols! Sounds like you had a great day. Wholesome Cook is right, the more you ignore the bad and praise the good the more good you will get in general. One thing I did with DS and DD1 when they were younger was take whatever they were fighting over including titles e.g princess/boss etc, off them with the words “if you can’t play with it together you can’t have it at all” then I developed a very strong form of deafness until they agreed to play with it together without fighting or play something else. We did really have a great day, and ignoring the squabbling is working quite well. The fake argument that they did to test my inability to hear squabbling was one of the funniest things I’ve ever heard! Sounds like a perfect day…warts and all! If ya know what a mean. You’re right there’s always a story behind the facebook story. It really was a perfect day, in as much as it can be anyway! great post! And what good is focusing on the bad anyway? just gives me headaches. I love to remember the good times of a day because it then allows me to focus on the good even in my child. the sandwiches look very well presented as well. I love your honesty! Real life with kids. thanks Fiona! real life indeed – though I wonder if some people are really having the perfect lives that facebook presents? !